Thursday was a day that ends with 'y' — and you know what that means! 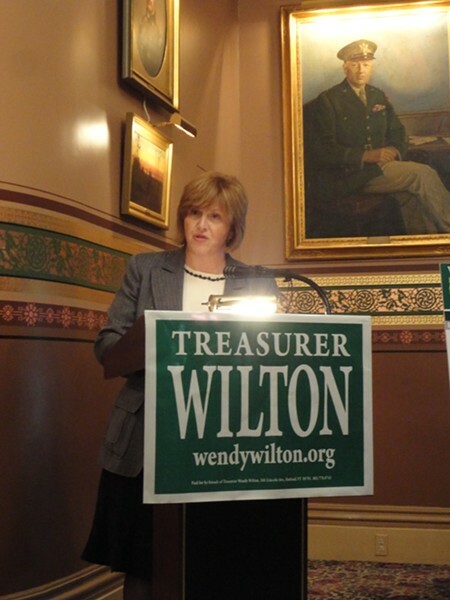 Republican state treasurer candidate Wendy Wilton was busy making outrageous claims she couldn't quite prove. To be fair, the Rutland City treasurer never actually makes accusations. She just suggests things. Like, real nutty things. The latest? That the Vermont Municipal Bond Bank put the city of Rutland on its internal "watch list" in June to screw with Wilton's campaign for state treasurer. Quite improbably, the bond bank became a bit of a political football earlier this week when Wilton's opponent, State Treasurer Beth Pearce, noted in a debate on WDEV's The Mark Johnson Show that — unbeknownst to Wilton — Rutland had recently earned a place on the bank's "watch list" due to concerns about its unfunded pension liability. Pearce's fellow Democrat, Gov. Peter Shumlin, followed suit Wednesday when asked at a Burlington Free Press debate about the treasurer's race — bashing Wilton for Rutland's inclusion on the list. That didn't sit well with the Rutland Republican. "My biggest concern is that two top officials of the state of Vermont used insider information that they had — and they mischaracterized it — and they put it out there for their political gain," Wilton said Thursday during a Statehouse press conference. "And I feel they injured the reputation of not only the city of Rutland, but several other communities in Vermont." But before the press conference even got started, Wilton's campaign manager, Bradford Broyles, took the criticism a step further while speaking with reporters. Noting that several members of the bank's board of directors have contributed to Pearce's campaign, he suggested the bank put Rutland on the watch list for political reasons — namely to embarrass Wilton. "I announced I was running for state treasurer in the middle of May. And then, come June, at the next Vermont Municipal Bond Bank meeting, there's this action where the board, which includes several supporters of Treasurer Pearce and contributors to her campaign, make a decision to develop this internal list, not shared with the communities affected," she said. "Rutland is cited as being on there for only its pension issue, which I told you about. And I just think the whole thing just seems rather coincidental in some way." Wilton added that she believed the list was "maybe incomplete or somewhat capricious." When Seven Days asked if she was alleging that the list was politically motivated, Wilton said, "I don't know that. I don't know that, Paul." Asked which members of the bank board were colluding with the campaign, she said, "I'm not stating that there's collusion. What I'm saying is the time frame here is what makes me wonder. That's all." We couldn't quite bring ourselves to drop the point. (Dialogue in italics indicates Seven Days' questions). "That's my big concern, Paul," Wilton interjected. But the other thing you raise which I don't understand is the notion you raised earlier on: that you got into the campaign in May and they created this list — put Rutland on in June. That was a really strong and serious suggestion — I'll use the word suggestion, not allegation here —"
"Makes me wonder," Wilton said. Are you going to back that up with anything — or is this just another suggestion? "Why do I have to back it up when that's the time line?" she asked. What you're saying there is that political donors to Beth Pearce's campaign sat on that board. What that is hinting at is something that would be extremely troubling if it's true. And I'm curious if you have anything to base it on. "Paul, I'm just pointing out the facts," she said. "There's the time line. Those are the facts." Asked by another reporter why Rutland was singled out, Wilton said, "Because it was political gain. Political gain. I think Beth Pearce is desperate at this point in time in the campaign, and this was a thing she could pull out and make Rutland look bad." Vermont Municipal Bond Bank executive director Robert Giroux did not return a call for comment Thursday, but he told Seven Days earlier this week that it's pretty standard for municipalities with management issues, deficits or unfunded pension liabilities to be temporarily placed on the internal watch list, which does not carry any repercussions. Of the 290 municipalities and school districts that have been issued bonds by the bank, 10 are currently on the list. While Pearce sits on the bank's board, she and its chairman, John Valente of Rutland, both recused themselves from the June vote — she to avoid a political conflict and he because it concerned the town in which he lives. The board's other four voting members are Giroux, Kathryn Boardman, David Kimel and David Coates. "If she implied that the vote was politically motivated, I find that very offensive," said Kimel, who says he recently gave Pearce's campaign roughly $100. "Quite frankly, I don't remember the exact dates, but I can tell you for sure I didn't even know who Wendy Wilton was or that she was running for office at the time the vote took place." Coates and his wife have also contributed to Pearce's campaign — at least $2000, in their case — but he took similar umbrage with the notion that his vote was politically motivated. "Absolutely not. That never came up. We wouldn't and couldn't do that. Period," he said. "From a personal perspective, I am shocked she would say that." Other highlights from Wilton's Thursday press conference? Though Pearce's campaign earlier Thursday circulated a copy of an email Wilton sent from her city email account inviting city workers to her campaign kickoff, Wilton denied having done so, saying she was "very, very, very careful about this." Asked why she continues to falsely accuse the state treasurer's office of earning a "D-" in transparency from U.S. PIRG, Wilton denied doing so: "I did not say that. I said the state received those grades... The state as a whole." Asked whether her voting record during her single term in the state Senate was relevant to her current campaign, she said, "I don't believe it is." Why not? "Because when you're a legislator, you're there representing your constituents on political issues. 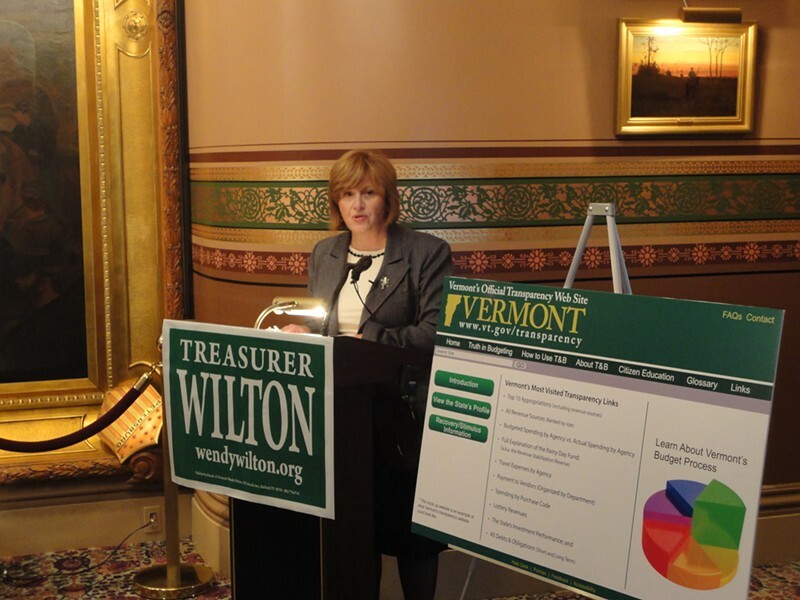 When you're elected treasurer, you're representing the state of Vermont strictly for financial and fiduciary issues. I think they're very different roles, Paul." Has she ever expressed an opinion about the merits of single-payer health care? "I don't believe I have," she said. "What I've expressed is an opinion on what I see as the financial issues related to reform." Asked if she now remembers a comment she wrote in December 2011 on the conservative blog Vermont Tiger calling single-payer "a huge stealth increase on Vermont's middle class," (she didn't remember it earlier this week) Wilton said, "I probably did give that opinion. That was a long time ago." Asked again, she said, "If it was on that website and you're claiming it, yeah, I may have said it." I'm not claiming anything. I mean, it's on the website under the name Wendy Wilton. And my question to you is: did you write that comment? You've had a chance to see it now. "You know, people who run for office are also citizens, and they have a right to an opinion. But once you start running for a particular office, you need to be sensitive to the fact that you no longer do those things. Okay? To be fair, you know, yeah, did I put out there maybe a snarky little comment? Sure I did. But does that matter now? No. Because the role of treasurer, again, on health care is to look at the reforms and ensure they're sustainable. And that's what my research has been about and that's what I would do as treasurer to worry about sustainability and not worry about the policy."